Established in 1991, Tony's has been a fixture in the hustle of downtown Sacramento for 28 years and counting. Family owned and operated, we take pride in providing the best product in town. Tony's offers only the highest quality domestic and imported products, including fine meats and cheeses, fresh fruits and vegetables, bread baked fresh daily, and many weekly specials that are homemade 'secret' family recipes. Tony's has provide quality catering services to the Sacramento area for 28 years. Contact us to cater your next event--big or small. You won't be disappointed. On the deli side, Tony's delivers a reliably delicious dining experience to our customers daily. Customers have described us as "a no-nonsense, California-meets-New York style" authentic deli. We have to agree. If you are looking for a large selection of gourmet sandwiches and salads, high quality product, with in-and-out service at prices that can't be beat for the quality and size, you've found the right place. *Some online specials may not be on our special board when you walk in, but if it's online, you can order it...unless we sold out. *Additional specials can be found on our special board on the deli counter. 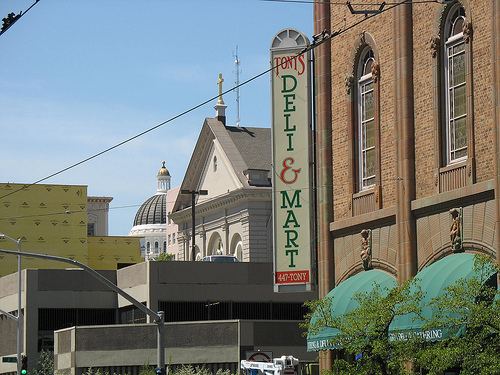 Tony's is﻿ conveniently located on the corner of 12th & J Streets, in the historic Masonic Temple building, in the heart of downtown Sacramento. We are just two blocks from the California State Capitol, one block from the Sacramento Convention Center and the Cathedral of the Blessed Sacrament, and within walking distance from the Golden One Center, the courthouse and downtown hotels, including the Sacramento Hyatt Regency, the Citizen, the Sheraton & the Sawyer. There are several public parking garages within walking distance and limited street parking is available.